Could you get a more gothic name for a beer? 3 Ravens ………. dark ……… smoke ………….. it sounds like the lyrics to a Bauhaus song! Of course, then there’s the mention of beer and traditionally, Goths are cider drinkers. I tried my 3 Ravens Smoke Beer in the beer garden of the wonderfully old skool Yarra Hotel in Abbotsford, Melbourne, without a goth in sight. 3 Ravens Dark Smoke Beer … strangely there are 4 ravens on the label? This is indeed a dark beer, the colour of antique mahogany, cloudy or you might say, smokey. The aroma and initial taste is (un)surprisingly smokey too. Like a fermented Lap Sang Su Chong tea, once you are over the first sip, the smokiness dies down and the beer becomes ……… interesting. Not quite a session beer but I reckon it’d go well with barbecued ribs or pork sliders. Don’t knock it till you’ve tried it. Here’s the kings of moderation, The Pogues, with “Bottle of Smoke” ……..
“Be true to the beer and those who drink it” is the motto of the Mornington Peninsula Brewery in Victoria. It had been a while since I’d tried a brown ale, having once been a fan of the “old dog”, the famous ‘Newcassle Brun Eel’ and the occasional ‘brown & bitter’ (a good way of getting nearly a pint of beer for the price of a half!). 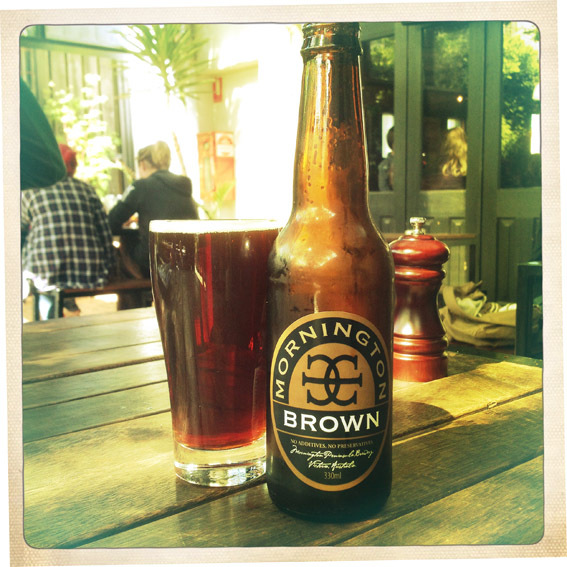 Mornington Brown – true to itself and those who drink it. I sampled this one in the Coburg Hotel in Melbourne. Victoria is famous as the home of Ned Kelly. Ned appeared a gentleman in comparison to The Coburg, and at $10 a bottle I felt like I’d been robbed ….. and yes, it was still daylight. Happily, this was a fine brew but whether it justified its price tag is debatable. Very English in style (it’s made with malted English hops) it pours a beautifully clear, mahogany brown. Nutty and slightly sweet it is indeed reminiscent of ‘The Dog’, bringing back memories of a famous Cornish victory over Yorkshire in the 91 County Championship. Many a dog was put to sleep that day ………. and several the day after! This is an authentic brown ale that slides down very nicely, a little too nicely for $10 a pop but ultimately worth it for the memories. Roger Hargreaves is the author of many a Mr Man book ( just ask my son). 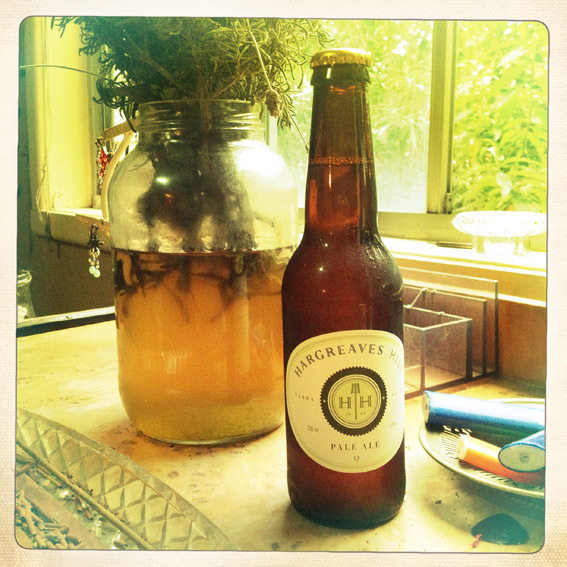 Hargreaves Hill Brewery is a phoenix that arose from the ashes Black Saturday bush fires of 2009 in Victoria’s Yarra Valley and has nothing to do with Roger Hargreaves. The brewery was founded in 2004 but had to start over again having been destroyed in the maelstrom. I found their Pale Ale in the rather wonderful “Cheese Shop” in Melbourne’s Nicholson St, taking advantage of their “mixed 6-pack of craft beer for $22” offer. Any savings made on this great deal was immediately reinvested in 200 g of Shropshire Blue and some black pepper crackers. An investment that was to pay dividends later. Hargreaves Hill Pale Ale claims to be an English-style pale (made with a mixture of American hops). The result is somewhat mid-Atlantic but nonetheless eminently drinkable. Lacking the toffee undertones I associate with an English pale, it does have a more subtle American trait of citrus rind bitterness. Easy drinking is the word for it, or rather, 2 words of it, nothing earth-shattering …….. but it does go well with a slice of to two of Shropshire Blue. Here’s a little American flavour, The Fun Lovin’ Criminals with, ‘Up On The Hill’ ……………….. If a bird in the hand is worth two in the bush what is Two Birds in the hand worth? It’s worth drinking that’s for sure. I’d always associated the Victorian town of Spotswood with the slot-car movie of the same name, starring Anthony Hopkins, that inspired the “Fast & Furious” franchise. It seems Spotswood could soon be known for craft brewing too. 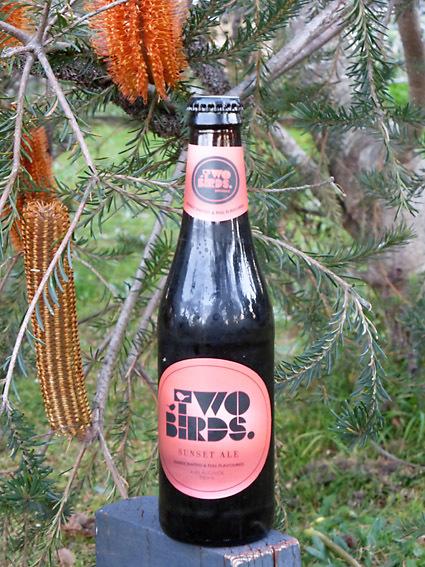 The name alludes to the fact that the brewers in question are in fact ‘two birds’, of the female variety. Making their way in a very male-dominated industry must be hard (conversely, I know my mates Jonno and Des struggled with their cupcake business) …….. but the girls have done good. Mahogany in colour, it has notes of toffee on both the nose and the tongue. I would have preferred a little more bitterness in the finish and maybe a third bird would have would have been the icing on the cake. Overall, an easy drinking English-style ale, best poured into a glass and supped slowly. I’d also like to see a “Spotswood Ale” with a picture of a slot-car on the label. Perhaps I’ve left this one a little too long on the shelf, after all, I did buy it at a bargain bucket price, as part of Christmas-special box of 6 ….. back in March. Being a hand crafted ale, free of preservatives does have its disadvantages and some things don’t improve with age. 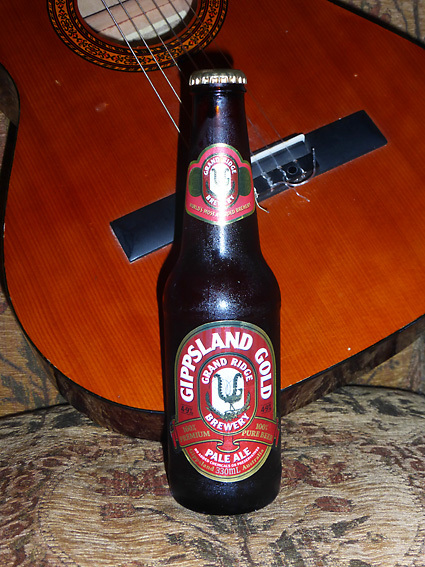 Grand Ridges’ Gippsland Gold – ‘All that glitters ……………’. In spite of being past it’s best and a little flat, this dark, honey-coloured pale ale showed good potential. Sweeter than your average pale and reminiscent of the “Yarra Valley Gold“, it has nice toffee apple undertones and, with the fizz that accompanies all of us when in top condition, this could be a real winner. I’m willing to re-visit this one at a later date. Following my own advice for once, this evening I’ve opted for more of a winter-style ale, a chocolate porter. My recent experiences with chocolate ales have been favourable so I was quite looking to this one. 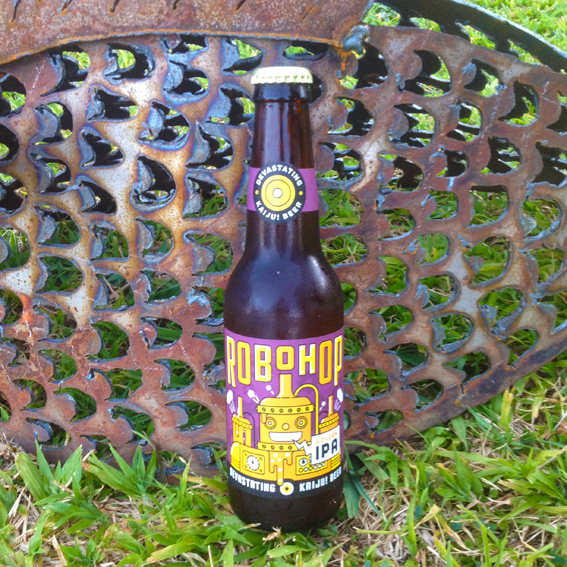 The Holgate Brewhouse is based in Woodend, Victoria and has been brewing since 1999. 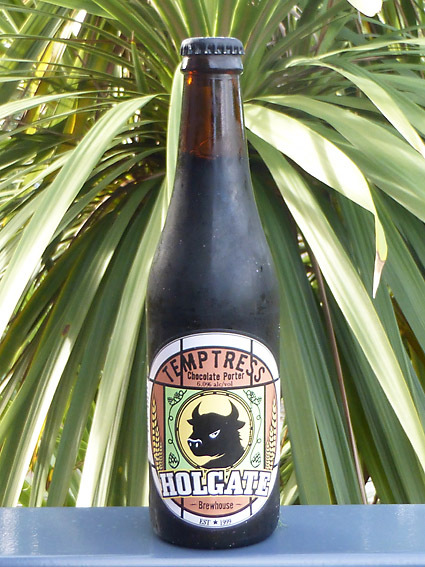 Their dark ‘Temptress’ is brewed with Dutch cocoa and vanilla beans and the taste is nicely balance between the two with a hint of coffee . Neither bitter nor sweet, it’s rich and smooth and better drunk at something like winter room temperature to allow the flavour to come through. At 6% its stronger than your average bar of Bournville. Try with slabs of wagyu beef or at bedtime. Whilst beer hunting in Maroochydore a couple of weeks ago I came across a Christmas gift pack of 6 ales by the Gippsland-based, Grand Ridge Brewery. At $8.00 for a 6-pack it was too good to be missed, and after tasting their ‘Yarra Valley Gold’, I wish I had stocked up. (In the interest of fairness, I did try their wheat beer last week, but I’ve decided that wheat beers stick in the craw and my opinions on them are best kept to myself). But if you want my opinion on this deep amber ale, I’ll happily give it to you. Bottle conditioned, it’s slightly cloudy with tight bubbles. There’s an aroma of toffee-apples and this scent is backed-up in the flavour, deep, rich undertones of toffee, caramel and ANZAC biscuits, enough hops to take the sweet edge off, and a nice smooth finish. 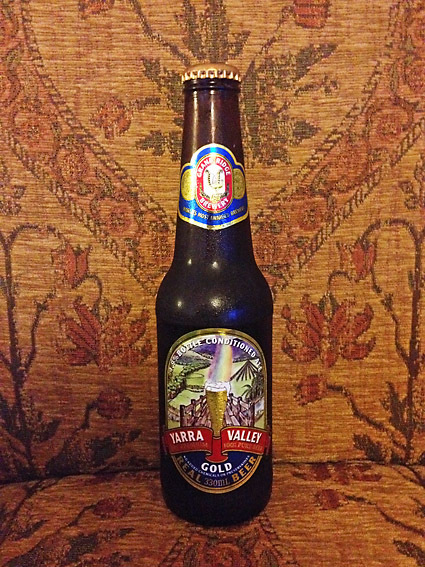 Forget wheat beer, go for Gold ……… the perfect winter ale. ‘No need to panic, it’s all organic’ ….. that doesn’t mean you can throw the skins out of the window! 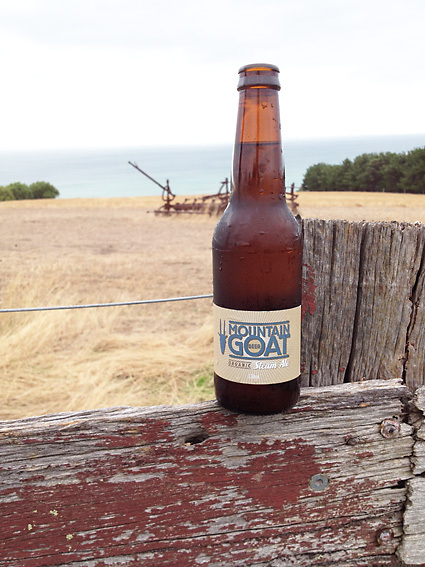 Mountain Goat Beer began in ‘Dave’s backyard’ but now operates out of Richmond in Melbourne. I doubt there’s many mountains there but there might be the odd goat …. or at least goatee. 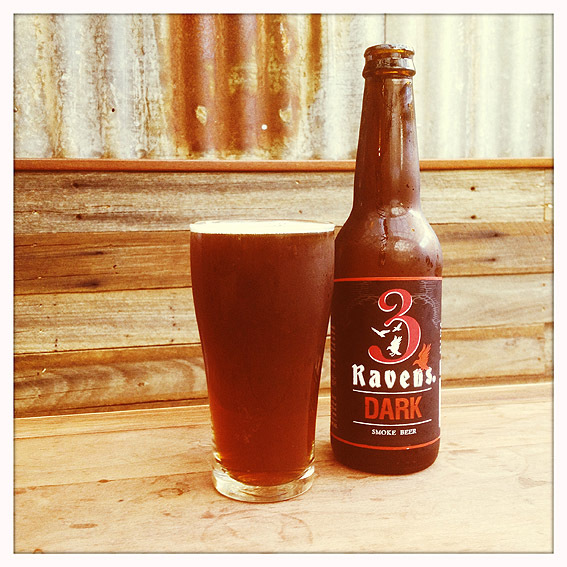 I first tried their Organic Steam Ale at my good friend’s wedding, at the Jack Rabbit Winery in Bellarine. It was just what I needed after an afternoon’s shooting ….. no pressure photographing your friend’s wedding I can assure you. Mountain Goat Beer, Organic Steam Ale – full steam ahead! As steam ale is basically a lager, and this is a pretty good one. It’s a pale straw in colour and I smell hints of lemon sherbert on the nose. It’s clean, crisp and refreshing …. I had another one this evening after mowing the lawn and it went down a treat ….. restoring my faith in lager. The Sun Herald called it ‘an organic triumph’ …… sounds like a motorbike that runs on hemp-seed oil. Ok, this is going to be a bit unfair on all concerned, I seem to be coming down with some sort of cold and can neither smell or taste with my usual alacrity. Can’t even take a decent photo! 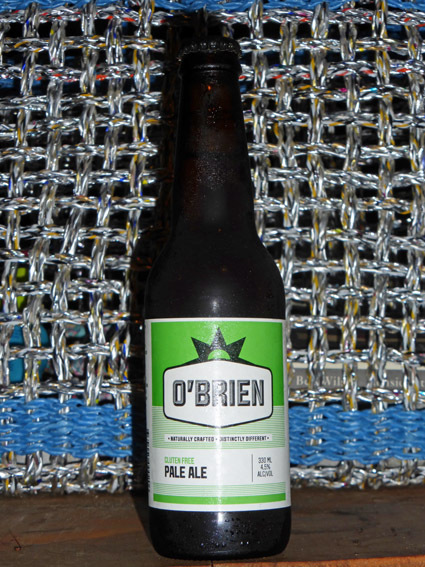 Rebellion Brewing’s O’Brien range of beers are all gluten -free. I’d say this pale ale was made using millet and sorghum, malted to Rebellion’s exacting specifications and certainly tastes gluten-free. Perhaps it’s the gluten that missing or probably this evening’s limited plate, but it isn’t really doing for me. Goes well with paracetamol though. This one goes out to me mate, Pete, who greeted me with a mixed six-pack of beers to review ……. and he doesn’t even own a brewery (cough, cough). And my second cousin, Sarah, a new Beerhunter365 convert, who sadly departed today …… only as far Sydney mind you.